Anti-government protesters are blamed for dousing a state-sponsored radio station with gas bombs and molotov cocktails Monday afternoon in Managua and police responded with gunshots. Masked men on motorcycles surrounded the area near Radio Ya in the capital city, preventing other vehicles from entering as the attack was carried out. Other participants in the attack stood atop buildings and fired homemade mortar guns in the direction of the radio station. After the attack, the assailants celebrated in front of the burning building, raising their arms in victory and firing mortars in the air. Initial reports indicate there weren't any deaths in the attack. Several people were injured, including one person who was shot. Paramedics said none of the injuries are likely to be life-threatening. However, in the hours after the attack at Radio Ya, riot police arrived in the area and video from 100% Noticias shows them firing shots. Numbers of injuries remain to be determined. After the attack on Radio Ya, a state-sponsored television station blamed the "fascist right" for being "incited by hatred and their desire to silence the truth." According to La Prensa, a newspaper critical of Nicaraguan President Daniel Ortega's government, the attack against Radio Ya was conducted after pro-government civilian groups, known locally as "turbas," or mobs, allegedly attacked student protesters at the National University of Engineering, located about two miles from Radio Ya. 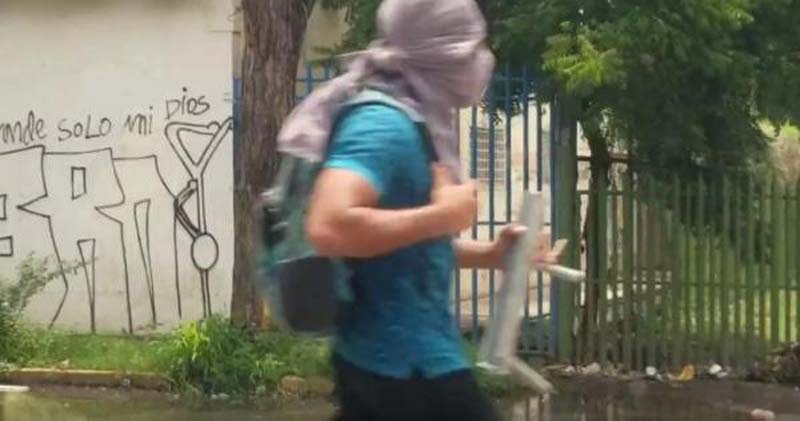 Erika Guevara-Rosas, the Americas Director at Amnesty International, witnessed the confrontation and said the turbas attacked students with firearms. The violence Monday was just the latest since deadly protests broke out across the country in April. Beginning on April 17, people began protesting changes to the country's social security law, which raised taxes and cut pensions. As the protests grew, the national police cracked down and have been blamed by human rights groups for killing more than 70 people, many of them university students. Protests have since continued throughout the country and the list of grievances now includes a push for justice over the protester deaths. Before Monday, the national police force has mostly stood down from controlling protests since the violence in April. But there has still been periodic clashes reminiscent of Monday's attack -- with each side of the conflict blaming the other. Anti-government protesters blame pro-government gangs for instigating violence during demonstrations. In turn, pro-government media blame "right-wing vandals" for any destruction. After six weeks of protests, the death toll has grown to more than 80. The latest victim was 30-year-old Jorge Gastón Palacios, a government employee at the National Institute of Technology. Gastón died of bullet wounds after he was shot at a roadblock set up by anti-government protesters during a confrontation between them and pro-government civilians in Boaco, about 56 miles east of Managua. Police spokeswoman Vilma Rosa González blamed protesters for the killing while protesters there told Confidencial that the only people with guns in that incident were the pro-government civilians.